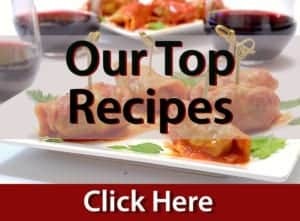 Slow Cooked Tomato Sauce with Roasted Red Peppers is a simple sauce that you can use on top of pasta, chicken, casseroles, and so much more. Although you don’t have to let it cook overnight, its taste if you can wait a day to enjoy it. 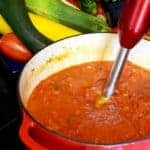 Slow Cooked Tomato Sauce is a mini garden sauce pot that freezes well and so you can enjoy it all year long. 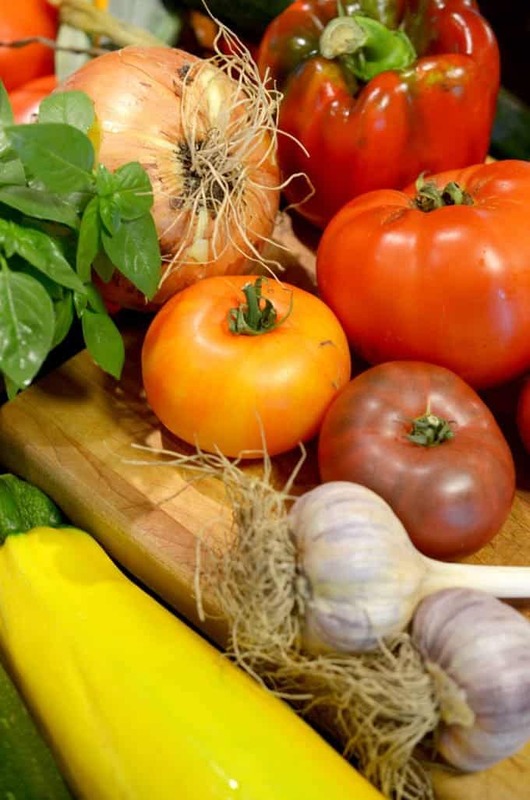 Fresh Farmers Market Produce makes this Slow Cooked Tomato Sauce the Real Deal. A big pot, a lidded Dutch oven works great. How many times have we said that simple is best, even when it comes to cooking? No other recipe illustrates this principle better than Slow Cooked Tomato Sauce. 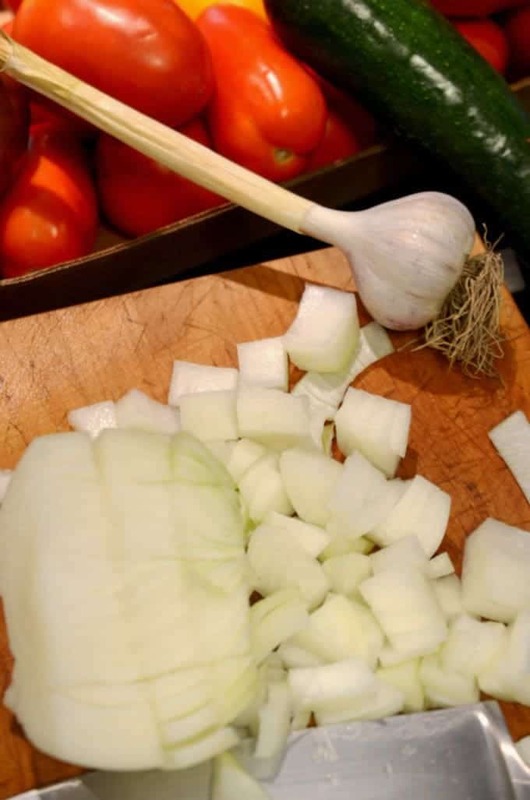 Yellow sweet onions are diced and sautéed in this Slow Cooked Tomato Sauce thereby adding even more summer flavor. Purists will tell you to seed your tomatoes and furthermore to get rid of the skins. Certainly, you can do that if you wish. When I first started making my homemade tomato sauce, I would leave everything, including the seeds and skins. Then, I read that tomato seeds add bitterness and that the skins in general also detracted from the flavor and the sauce presents better without the skins. And so, for a few years, I did the arduous process of hot water blanching, skinning and seeding all of the tomatoes. This proved to take a lot of both time and effort, but I always told myself that I was doing it in the name of good culinary practice and in the name of better taste. We left the seeds and skins on our tomatoes for this slow-cooked tomato sauce. Paola is one of the best cooks that I know. In case you are wondering, and as you might have guessed, I stopped seeding and skinning my tomatoes for slow-cooked tomato sauce and have never looked back. Yes, a slow cooker or crock pot is an excellent tool for this sauce. Instead, though, I made this slow-cooked tomato sauce a one-pot wonder and used my Lodge Dutch oven, from start to finish. By the way, this particular brand rates among the highest of Dutch ovens and also among the most affordable. Can you say, “Win, Win!? 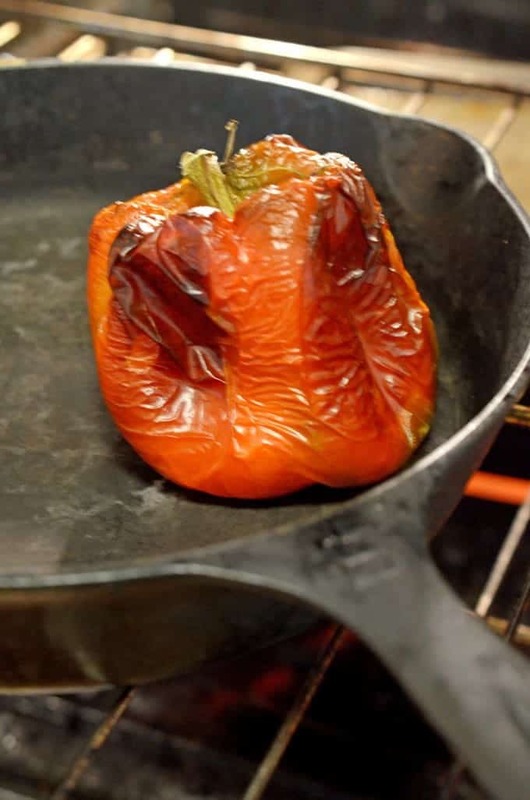 We like to make the best use of fresh summer produce that we can, and moreover, we used some roasted sweet peppers in our slow cooked tomato sauce. Place the pepper in a hot oven. 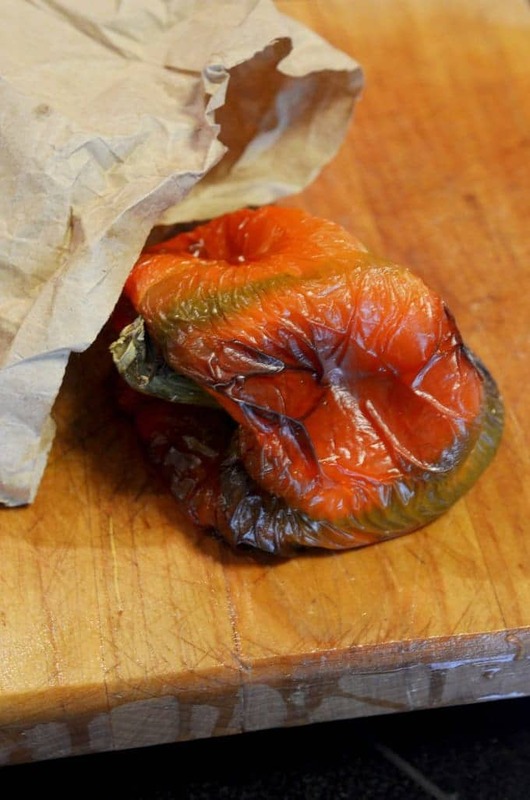 Next, place the pepper in a paper bag for 5 minutes. Finally, peel skin of pepper and cut into thin strips. Place pepper in a hot oven at 400℉. Allow roasting until bubbly and brown all over. It’s not pretty by the time it finishes but remember, beauty is only skin deep! Once you take it out of the oven, let it steam in a paper bag for five minutes. Crimp the opening of the paper bag closed to keep the heat inside. Remove from paper bag and then peel the skin off. 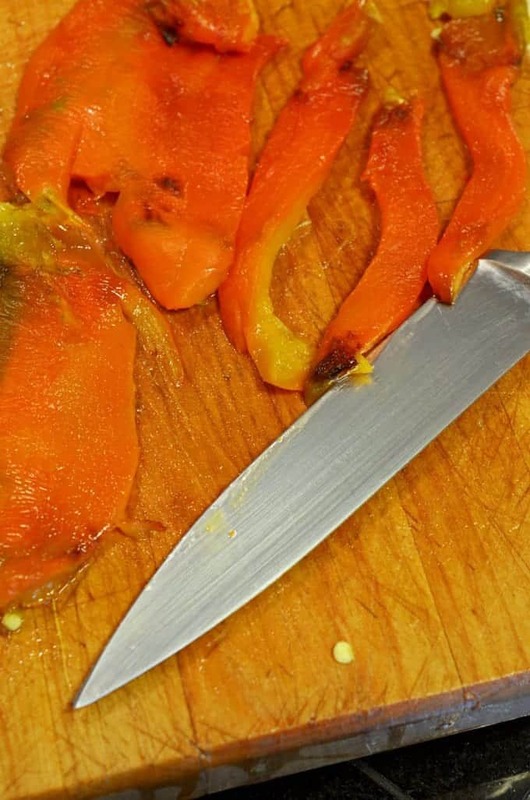 Cut the pepper in half, remove pith and seeds and then slice or dice, as needed. 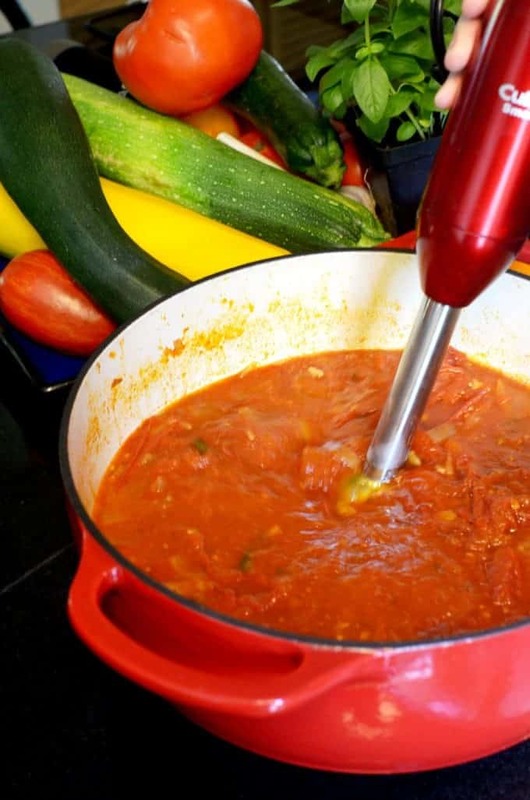 As you will see in the full recipe below, this Slow Cooked Tomato Sauce could hardly be any easier to put together, thus making for a fresh and flavorful sauce. Sweet bell peppers are in season now and therefore create a great backup cast to the stars of this sauce, the red, ripe, and juicy tomatoes. Give this sauce a try this weekend and have a fresh taste of summer. There will never be a better time to make it. We smooth this Slow Cooked Tomato Sauce out, with an immersion blender. 1-2 large sweet bell peppers seeded, peeled and, cut into strips. Heat 1 tablespoon olive oil in a large, heavy skillet over medium heat and add onion. Cook, stirring often, until tender, about 5 minutes. Add garlic and stir until fragrant, about 1 minute and then add red wine and reduce to half volume. Add tomatoes, peppers, salt, pepper, sugar and basil sprigs and then increase heat to medium-high. 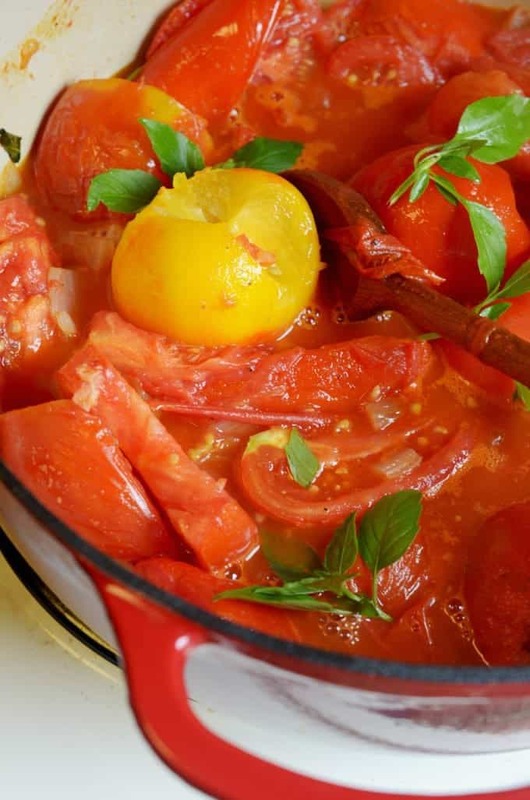 When tomatoes are bubbling briskly, stir and reduce heat to low simmer and cover. Allow to cook on low for a couple of hours, or overnight if possible. Stir every once in while. Remove basil sprigs and then taste and adjust seasoning to your preference. Use immersion blender to smooth out the sauce. Do not over blend, leave some texture as desired. If sauce is watery, remove cover and allow to reduce while cooking. Thicken with optional tomato paste if desired. Serve when ready and garnish with chopped fresh basil. This slow cooked tomato sauce can certainly be made in a crock pot or other slow cooker. Simply follow the basic recipe and transfer sautéed ingredients to slow cooker. I bet this would be even better when tomatoes are in season here <3 totally saving this for next year! Great sounding sauce, the peppers are a lovely touch and add a depth of flavour to the dish no doubt… I am with you on seeding and skinning tomatoes for slow cooked sauces. You mean Not seeding and skinning? I LOVE slow cooked tomato sauce, especially with roasted peppers. Such a great flavor! The longer the better! i love sweet peppers but never think about the combination of them and tomatoes. nice idea, Dan. this is awesome for a hot summer day. anw i’ll try this out. have a nice day, i forward more posts from you. Thanks so much, Pat; it’s great to hear from you here on Platter Talk! This would be delicious on anything. And now I am totally craving it! That sounds so packed with deep flavors! Nothing better than a homemade tomato sauce! This sauce sounds awesome! I don’t have a slow cooker. Do you think I can make it in a skillet? A classic combination for such good reason, tomatoes and peppers just make each other sing! I love the combination of tomatoes and roasted peppers. Sounds delicious! I just made a sauce with tomatoes, an onion and some basil, my husband raved …. but this looks so much better to me! 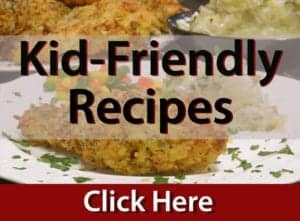 I’ll be trying this recipe the next go round. Love slow cooked foods … they taste amazing! Fascinating! I have always blanched and seeded, I am tempted to try it the “easier” way now! Good read as always Dan. P.S. I also have a Lodge Dutch Oven, love it! Ben, so great to hear from you and hope things are going well! Oh yes! THIS GIRLLLLLL would loveeeee some of that! 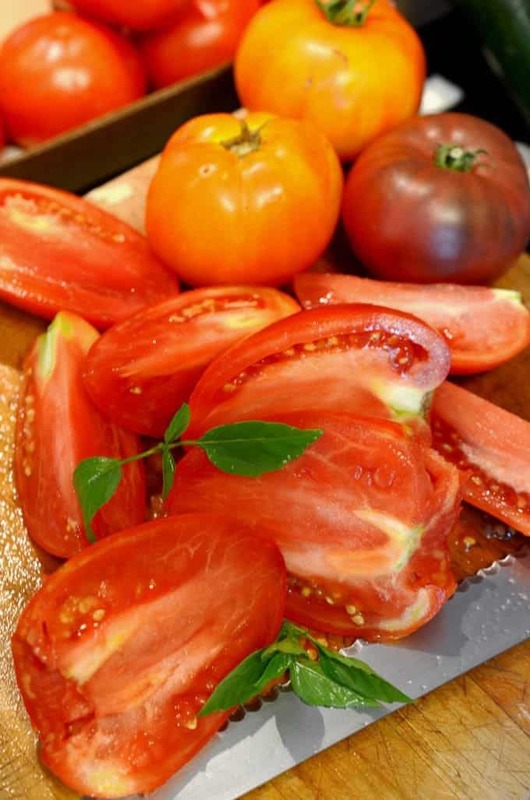 Pick some tomatoes up this weekend, GiGi and turn that stove ON! I can think of a hundred things this sauce will be great on!!! Tomatoes and roasted bell peppers is my absolute favourite sauce base! Thanks for the comments, Tina! We’ll be using this all year long! Such a perfect sauce for summer! Love the combination of tomatoes and peppers. Tossing all the tomatoes in sounds so much better than blanching and removing the seeds. Thanks, Tara and yes to all of the above! Hope you’re having a delicious summer! I’m a huge fan of sweet peppers, but never thought to use them in tomato sauce, this sounds wonderful! Thanks Sue! We hope you try this sometime soon! Your tomato sauce looks so fresh and beautiful. I love how simple it is. I can’t wait to make this. I know all kinds of dishes this would be great on. Thanks, Katie! Hope you are having a great summer! Love, love, LOVE keeping it simple in the kitchen! This sauce looks absolutely wonderful – perfect way to use all of my tomatoes!! Thanks so much, Sarah; we can’t enough of tomatoes right now!